Detroit Free Press, Nov. 25, 1913. Vito and Salvatore Adamo, leaders of a Sicilian underworld faction in Detroit, were murdered on their way home from work in the late afternoon of November 24, 1913. The brothers worked as wine and liquor peddlers. At about five o'clock, they exited the saloon of their partner Peter Mirabella on Mullett Street (close to the current Nicolet Place) near Rivard Street. They walked along Mullett toward their residence, 486 Champlain Street (now East Lafayette). But they were ambushed. Two men had been loitering on Mullett between Rivard and Russell Streets (Russell no longer reaches the area). As the Adamos approached, those men drew sawed-off shotguns from their coats, fired large slugs into the brothers and fled. Police arrived to find two dying men in the gutter in front of 170 Mullett Street. Vito Adamo, thirty years old, died on the way to St. Mary's Hospital. Salvatore Adamo, twenty-one, died at the hospital about half an hour later. The Adamos were buried at Mount Olivet Cemetery, Thursday, November 27 - Thanksgiving. Local authorities attributed the murders to an ongoing feud between Sicilian gangs in Detroit. Vito Adamo, with codefendant Phillip Buccellato, had recently been tried for and acquitted of the August 1913 murder of Carlo Caleca (also spelled Calego). Caleca was a Black Hand extortionist believed to be working with the Giannola Gang. The Adamo brothers were arrested following an early November attempt on the life of Italian banker and "padrone" Ferdinand Palma. They were released when they convinced authorities that they were close friends of Palma. 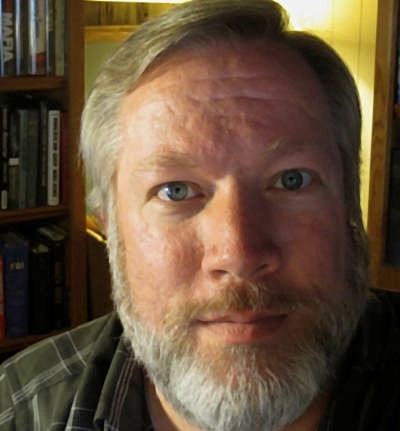 The Detroit underworld feud did not end with the deaths of the Adamos. Violence among local underworld factions continued through the Prohibition Era. Carlo Calego Death Certificate, State of Michigan Department of State Division of Vital Statistics, no. 6327, Aug. 8, 1913. Salvatore Adamo Death Certificate, State of Michigan Department of State Division of Vital Statistics, no. 9030, Nov. 24, 1913. Vito Adamo Death Certificate, State of Michigan Department of State Division of Vital Statistics, no. 9029, Nov. 24, 1913. "Dying statement may convict two," Detroit Free Press, Oct. 10, 1913, p. 8. "Two exonerated in murder case," Detroit Free Press, Oct. 14, 1913, p. 5. "Ten killed, six wounded; Black Hand record in Detroit in eleven months," Detroit Free Press, Nov. 25, 1913, p. 1. "Two Italians, brothers, are fiend victims," Port Huron MI Times-Herald, Nov. 25, 1913, p. 6. "Two more slain in Detroit streets in bitter Italian feud," Lansing MI State Journal, Nov. 25, 1913, p. 14. 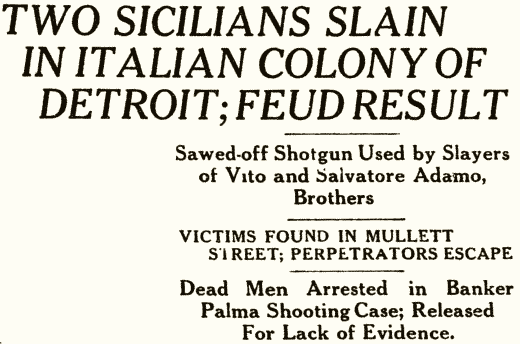 "Two Sicilians slain in Italian colony of Detroit; feud result," Detroit Free Press, Nov. 25, 1913, p. 1. "Two more marked for death in blood-feud of Detroit Sicilians," Detroit Free Press, Nov. 26, 1913, p. 1. "Widow's oath is blamed for bomb deaths," Detroit Free Press, April 13, 1914, p. 1.